What's that pretty Ivy growing in your Back Yard? 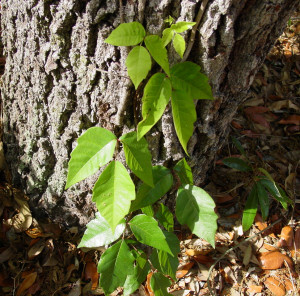 Many people confuse Poison Ivy plants with Virginia Creeper. Both plants are considered invasive and will grow rampant if allowed. Some consider the Virginia Creeper an ornamental mainly because of its vivid fall color. However, handling it can produce much the same toxic symptoms as Poison Ivy in people who are susceptible. "Leaves of three - let it be" is good advice with regards to Poison Ivy. However, leaves can be made up by as many as nine leaflets. Therefore, this is not to be considered as definite identification. One sure way to make the distinction is that the fruit of Poison Ivy grows in clusters known as a drupe, which looks much like a grape cluster, and is greenish-white in color. The fruit of Virginia Creeper is a dark blue, almost black berry. 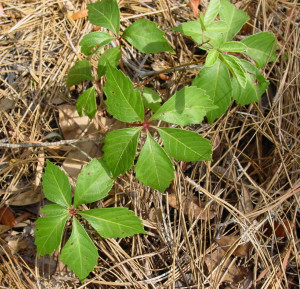 Another easy method of identification is that Poison Ivy has leaves made up of 3 or more leaflets which have distinct stalks (petioles) arising from the main stem which is reddish in color. The leaves are green in summer and reddish in the fall. Virginia Creeper normally has 5 leaflets, but that may also vary. However, the stalks are so short that they are nearly unnoticeable. New leaves are reddish when they emerge, then turn green as they mature. Poison Ivy as well as Virginia Creeper occur throughout the US and if you are unlucky enough to have either growing in your garden, be prepared - they are not easy to get rid of. Because they almost always grow among your ornamental shrubs or trees, herbicides are not the answer, as they will kill surrounding plants. The best and also the most task intensive way, is to pull the plants out by hand, making sure you get every bit, including the root. Be sure you wear long sleeves and gloves. Don't ever burn Poison Ivy plants as the smoke will give off a toxin which will irritate your lungs. For persons who are allergic to Poison Ivy (which is about 8 out of 10 people), skin contact with any part of the plant will produce an ugly red rash accompanied with extreme itching, which erupts in streaks or patches of blisters and may last up to three weeks. Initial first aid is to thoroughly wash the skin with soap and warm water immediately or at the earliest possible opportunity. There are a number of over-the-counter remedies you might try, including calamine lotion and hydrocortisone cream. In severe cases of reaction after contact with either Virginia Creeper or Poison Ivy, contact your doctor.